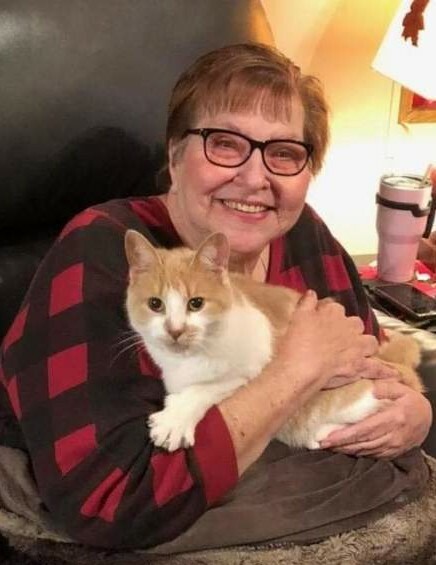 Nancy Eva Treska-Normile, 68 Years, of Prudenville passed away on Thursday April 4, 2019 at home surrounded by her loving family. Nancy was born on May 21, 1950 in Detroit, Michigan to Robert and Dolores (Markows) Godin. She grew up in the Detroit area where she graduated from high school. Nancy was married to William Grant Treska in Detroit on August 22, 1969. The couple moved to Houghton Lake from Warren in 1987. Grant preceded Nancy in death on November 6, 1997. On January 31, 2004 at St. John Lutheran Church, Houghton Lake, Nancy married Kenneth Anthony Normile. She worked as a beautician in her younger years and became a self proclaimed Domestic Engineer with the start of her family. She was a housewife, homemaker and mother of four children. Nancy was a member of St. John Lutheran Church, and the Houghton Lake Eagles. An avid supporter of her family, she loved spending time with her children, especially the grandchildren. Surviving Mrs. Normile are her loving husband of 15 years, Kenneth Anthony Normile of Prudenville; three daughters, Deborah (Eric) Tiepel of Roscommon, Nancy Treska of Mt. Pleasant, and Renee (Andrew) Melzak of Ithaca; son, William "Bear" Treska of Houghton Lake; five grandchildren, Thomas, Audrey, Elaina, Bode, and Brooklyn; three sisters, Rose (Terry) Lawrence of New Hudson, Cynthia (Kenneth) Hunt of Higgins Lake, and Heather Pacro of Westland; two brothers, Tony Phillips of Detroit and Wayne (Robin) Phillips of Fenton; several nieces and nephews. Nancy was preceded in death by her parents and first husband, William Grant Treska and brother Michael Godin. There's still time to send flowers to the Memorial Gathering at the St. John Lutheran Church from 10:00 AM to 11:00 AM on April 27, 2019.